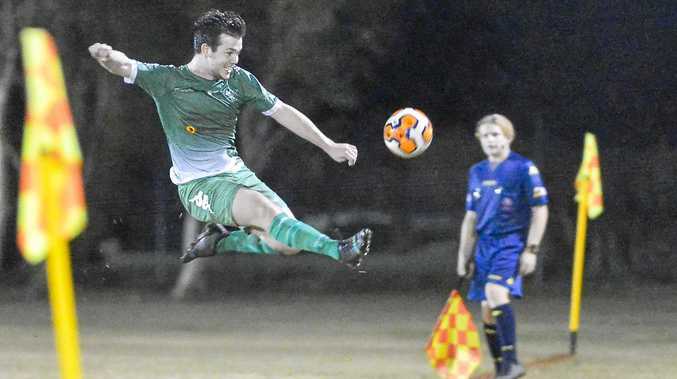 SOCCER: Clinton FC played a determined 3-0 win over arch rivals Frenchville SC to establish its top of the table lead Central Queensland Premier League Division One. With both hands firmly gripped on the minor premiership, Clinton wanted to make amends for its previous encounter with Frenchville. Clinton assistant coach Dan Horton saw positives with how training came together and the team beat its traditional northern rival. "It was a great win, an important one to keep us in first position with a little bit of breathing room," Horton said. "We had a game plan we'd worked on since we played Frenchville two weeks ago and the boys executed it well for the majority of the 90 minutes." During their last clash, Frenchville came away with bragging rights with a 2-1 victory, now the tables have turned. Both teams came out firing wanting to dominate its opponent. It was Clinton striker Sam Roberts who took full advantage of a Frenchville lapse in defence. "In the first half both teams were very cagey and were both just feeling each other out with neither side creating any real chances until Sam Roberts poked home after the keeper fumbled a long range shot minutes before half-time," he said. It was 1-0 to Clinton at half time and the home team was just starting to get warmed up and came out firing for the second half. "We started the second half really quickly after some outstanding work from Sam Roberts down the right flank to find Ethan Munster who netted the second goal just 40 seconds in to break the game wide open," he said. Clinton by now had the game in hand and wanted to make a point to its opponent why they are on top of the competition table. "We then pushed for a third goal to ice the game but had it cleared off the line," he said. "Liam Stephen got the third in the 60th minute. "Our defence worked well together under pressure when Frenchville pressed to get back in the game so to keep a clean sheet was a real positive." Clinton have the bye for the next weekend's game and look forward to resting players' injuries. "We will rest up next weekend with the bye coming at a good time given a few of the boys carrying some knocks," he said. "Sam Roberts was man of the match while Liam Jones and Anthony Cobb had strong games."